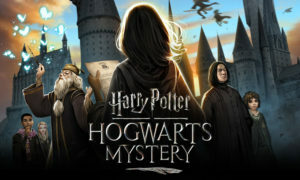 The Harry Potter Hogwarts Mystery game is an entertaining role playing game that can keep you busy for some time. It has a very good story line with a number of twists and side plots to make it interesting. As most of the games of this sort, you need energy and coins to progress in the game. How you use them will affect the speed that you can progress in the game, as well as at times what options are available to explore. The main currency of the game is energy that you need to finish any training, as well as at times interacting with other characters. Coins are needed to buy outfits that give bonus points towards one of the three character traits, being courage, compassion, and wisdom. Coins are also needed to fight duels, as well as invite friends to meals or drinks to strengthen your friendship with them. Crystals are needed to buy from coins to energy, skip waiting time and buy outfits. First off, we look at where to get some free stuff. You get crystals for completing lower levels of friendships. Normally level 1 to 3. So take your friends to the great hall, or drink butterbeer at the 3 broomsticks or play gobble stones in the courtyard. You also get crystal for completing some missions as well as learning new skills or potions. Lastly, you get free crystals a few times a day by watching a 30 second ad. Do save the crystals and spend them wisely as will be discussed later on. You get 2 coins for every energy that you spend when learning a skill or potion. You also get coins for completing tasks and missions as well as winning duels. Don’t go out and just buy new outfits with your coins, you are going to need them later. Energy is what makes the game go round. Energy is needed to complete training, do some missions, and interact with other characters. You start with a maximum of 25 energy. This refills at a rate of 1 energy unit every 4 minutes. As you do training and side missions, your maximum energy bar goes up. Often, doing flying lessons will give 1 added energy capacity for a new flying skill. You get a full energy bar when you level up. So do watch your character progress meter as you play. If you are close to leveling up, take a longer class, say the 8 hour class. When you level up in the class, you just got 2 or so stars for free. Currently the maximum character level is 41. Another way you can get free energy is by watching 30 second ads. 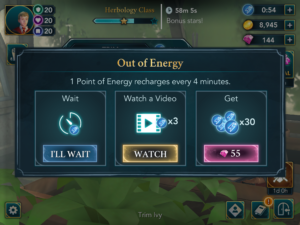 If you are doing a class or a mission and run out of energy, you will a few times a day be given the option to watch an ad. Normally the first time you click on a interaction that costs you energy when you have no energy will bring up a message that lets you choose the option to watch an ad. Once you have used up your free ad chances for a time period, that option is removed. However, always click 3 times on the interaction. Sometimes when you click ones or twice it does not give you the option to watch an ad, but on the 3rd click the ad option pops up. There are a number of places you can get free energy, a few times a day. Keep coming back to these places every 3 or so hours. 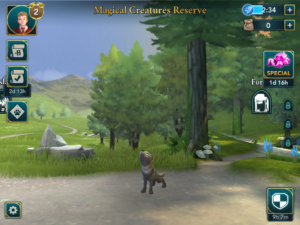 Magical Creatures Reserve: When the care for magical creatures are enabled for you, you will be able to interact with different creatures such as fairies. You can get a free energy unit if you click on the Wolf cup when it is around. 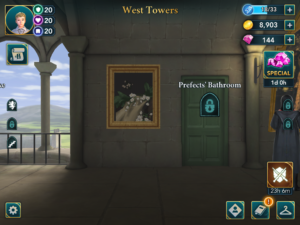 East Towers: There are two places to get free energy at the east towers. One is the portrait of a girl and the other Peeves. When the portrait of the girls is empty, click on it and she will appear while giggling. The poltergeist Peeves hangs around the stairs, click on him. West Towers: At the west towers, click on the portrait of fruit when the three fruits are not there. 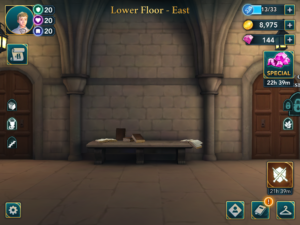 Lower floor west: The lower floor west has two places to get free energy. On the second set of guards, click on the middle guard when he has a sword. He will then hand it over to the guard next to him, and take his shield back. To the left is a column with a fire burning. Click on this when the fire is not burning. 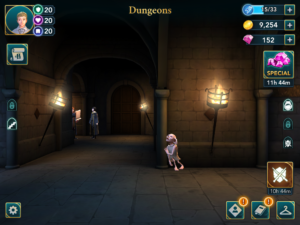 Dungeons: In the dungeons, click on the house elf sleeping against the wall. 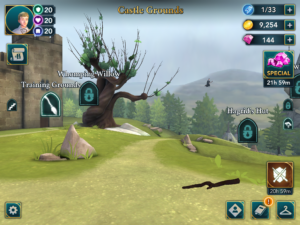 Castle grounds: In the castle grounds, click on the stick laying near the path leading to Hagrid’s hut. Lower floor East: Click on the books that are in disarray on the bench near the library. Hogsmeade: Click on the kid waving at you from down the alley where he is at the top of the hill. 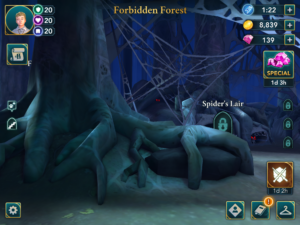 Forbidden Forest: Click on the large spider web by the tree near the spider’s lair. Dragon Alley: Go to the right until you are in line with Gringotts Bank. There is a small bag of coins on the ground. Tap on it. A niffler will jump from the crates on the left, grab the bag and then run away. Note that when you return the bag will be there again. However the niffler will hide in the crates until the counter has expired for that free energy. So just tap on the bag every time you pass by the scene or find another free energy available. When your pet is sleeping, it will be outlined with blue, click on it to get a free energy unit. For each pet that you have you get a free energy unit when it sleeps. 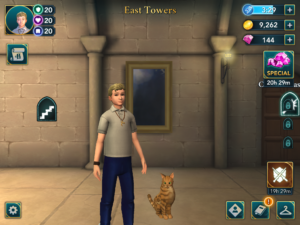 Go to your dormitory for your house to see pets that are not with your character on missions. Tips for spending energy, coins and crystals. You can speed the game up a lot as well as save yourself some crystals if you use your coins and energy wisely. Even if you are a power user that buys crystals to convert into energy, coins or skip time waits, you can make those crystals go further. When you take classes, do try to fill the the bar and get 5 stars if you get house points or character stats as rewards. Spending the energy is well worth it as you will need character stats to interact with other characters, such as make friends with them, respond to questions, or take them along in missions. If doing a mission or interacting with a character where the reward for stars are just coins, then save your energy. These interactions will normally be any interaction other than taking formal classes. These interactions normally have a 3 hour time period and a 1 star passing rate. Most require around 5 energy for a star, thus to get a 5 star would require 25 energy. If you have a full bar, you often can pass though the interaction in one go. This is okay if you are not going to be playing again for a while as you will get 2 coins for every energy you spend, and 10 coins for every star you get. However, if you have classes that you still need to attend to finish a chapter or you have a character that you can only access after waiting say 3 hours, then don’t spend all your energy on an interaction or class that only give stars as rewards. For instance. 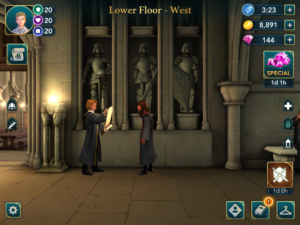 Say you need to meet Penny in 3 hours, but just started interacting with Rowan and that interaction lasts 3 hours. Then stop spending energy after 1 or two stars unless you have a full meter in the start. What you want to do is calculate it so that when the class ends, you end with a full energy meter. Say you have a 25 energy limit and start with 10 energy. That is enough for 1 star and a pass rate. To fill 25 energy takes 100 minutes, or 1 hour 40 minutes. Thus you have 1 hour and 20 minutes of energy that you can spend (or 20 energy units that is 2 additional stars). Thus you will finish that interaction with 3 stars and a full energy bar. You can then immediately interact with Penny with a full energy bar. You can do the same for classes where there is only a 1 star passing rate. Only spend enough energy to allow you to fishing the class while ending with a full energy bar. This allows you to quickly finish other classes. Note, don’t start a class if you cannot fill the required stars to pass. 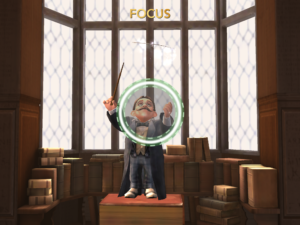 You will lose house points. If you cannot come back to the game soon, rather take a longer class to allow you more time to make the minimum stars to pass. Or wait until you have enough energy before starting a class. A class with a 5 star pass rating i would recommend you not start with less than 25 energy units. Don’t spend all you coins on outfits. You are going to need coins to build friendships with other characters, as well as do duels in the game. If your friendship level is not high enough for a character, you will not be able to take them along on missions or have certain responses available at times. When dueling, if you fail a duel, you can reduel, but it costs coins. So save them up. Normally, having around 1000 or so coins banked should see you through years 1 to 3. However, from year 4 on-wards i would recommend banking around 2 to 3000 coins as more duels and options to make friends with characters come up. When you do classes, you will have the option at times to select coins as rewards for completing stars. Most of the time it is mediocre offerings such as 25 or 50 coins. Skips these and select the food items or stat points. If however you are offered 1000 coins I suggest you take it. Crystals are great to get extra energy or skip a time wait. However, if you do not buy crystals, then every free crystal you get is precious. Don’t waste your crystals on micro transactions by buying 10 energy points every now and again. First, save your crystals up and buy pets. Pets give you free energy when they are sleeping, and in the long run will yield a better return than buying energy. Once you have bought all the pets you can, then spend crystals on energy if you wish. But go for the largest option or the 55 crystal option and only if you need it to finish a class. Normally a class requiring 5 stars to pass. Before taking a friend for lunch or a beer, see the requited stats your character needs. If you are under the stats, you may suffer points during the interaction. Rather do more classes to upgrade your stats or choose another friend to take to lunch. If you really want to take the friend to lunch, note that many answers have two right options. Choose the option that you have the correct stats. Having too low a stat, say courage, will result in a penalty for you and you may not make the stars you want. Dueling is a big part of the game, so learning the basics will get you far. There are also dueling competitions at times where you can win items. Dueling works in the way that you choose one of three stances in a round. The one that has a winning stance, gets to choose an action. The type of stance you chose depicts what actions you can chose. The stances are, Sneaky, Defensive, Aggressive (attack). Sneaky is at the top, defense at the lower right and aggressive or attack on the lower left. Going clockwise around, you need to chose a stance that is behind the other character’s stance. Sneaky beats defense. Defense beats attack and attack beats sneaky. Some options can stun you or your opponent. Any option that says it has a chance, you need to use carefully. If your opponent’s stats are close to yours, the chance is normally slim. Thus a medium reduction in opponent’s stamina option, often does more damage than a large chance of reduction in stamina option. It is a total guessing game as to what stance to choose. Often there is a pattern that you can work out, but at other times it is totally random. The two most common patterns are that the opponent keeps choosing the same stance, say sneaky. Or the opponent cycles clockwise through the stances. Other times it may have a pattern such as sneaky, defense, sneaky , defense. Write each action of your opponent down and see if you can spot a pattern. Apart from that, good luck. As you do side quests, you may learn skills that are said to be useable in dueling. These skills will be listed the next time you duel. For each stance, when you have a chance so select a skill, scroll down on the list of available skills. It is not apparent at first that there are mire skills available until you scroll down on the list. When you select an attack, try to select one that gives a sure result. Also try to select one that stuns your enemy if available. If an spell says it has the chance to do large damage or stuns, then that change is calculated using your stats as well as your enemy’s stats. The bigger the difference the larger the chance of success. To build your relationship with different magical creatures you can bond with them as well as feed them. You can search for food. However if find it time consuming and expensive. An easier way is to do classes. If the care for magical creatures is enabled at your level, then the rewards for completing each Star often has a option to select food. Many times you will get 6 or 9 food items. This is a more effective and cheaper way to obtain food. when you need to build up stars in later years before you can take a class, you have the option to select 2, 3, or 5 stars. The more stars you select, the longer the class will be. The 2 star class gives you 1 hour to complete the class. The 3 stars 3 hours and the 5 stars 5 hours on average. The longer the class is, the higher the rewards for points towards your stats, such as empathy or courage. However. The longer classes requires more energy to fill one star. If you want to get maximum points for your character’s stats, choose the longest class you can do and complete fully. If you cannot complete the 5 star class rather select the 3 or 2 star class as maximum points are only awarded if you fill a classes’ stars. If you only want stars to finish a quest to get books or a robe. Then select the 2 star class as it requires less energy points per star. This way you will get your stars quicker and use less energy. Although side quests slow down the progress of the main game, it does make it a lot more interesting. 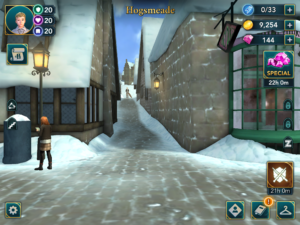 Some quests have a time limit to them, such as Hagrid’s party, while others do not. I suggest always doing side quests, especially becoming a prefect and a magnus where you can change into an animal shape. This will be very rewarding later. If a side quest has a time limit to it, always focus all your effort and energy on it and do it first. If you do other classes or quest than the one with the time limit, you may find that you run out of time before the quest is complete, unless you spend a lot of diamonds to get energy. When a event comes up where you compete for an item with your house, as well as events where you need house points to win, do the long 5 star class that is 8 hours. 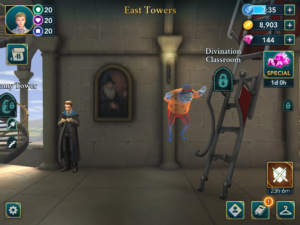 The longer class give you 10 house points for completing the class with 5 stars. The 2 star class may cost a bit less energy at around 15 energy points per star to the average 20 energy points per star for the longer class. However the short 2 star class only gives 2 house points for completing the class. The focus ring often comes up in classes. You need to be quick to get the ring in the correct position. However. You can make it easier for yourself. As soon as the ring starts to expand and contract, put your finger in the centre and hold it there. When the focus ring is in the correct position, quickly remove your finger. The game senses the up event of your finger leaving the screen and not a tap event. So you don’t need to tap the screen to get the focus right. At some points in the game, especially when do defence against dark magic, you will have to keep a point inside a green area on a vertical bar. The trick is to tap and hold the screen for about 2 seconds initially until the point reaches the bottom of the green area. As there is a small delay from when you lift your finger to when the point stops moving, it will slide into the green area. The moment it stops moving, it should be around the middle mark of the green area. Tap the screen again for about a second. The point should stay exactly where it is or move slightly up after you lifted your finger. Continue with a series of one +- 1second taps to keep the point in the green, remembering that the point is delayed so you have to respond before it move to counter the direction it will move in. Thus if it would move up you need to lift your finger and if it would fall down you need to tap the screen. 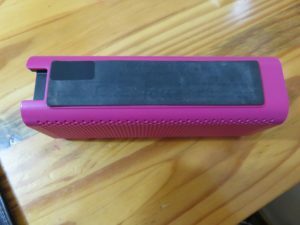 The Braven 705 Bluetooth speaker is a good travel speaker with excellent sound for its size. However, the internal battery does not seem to last long. 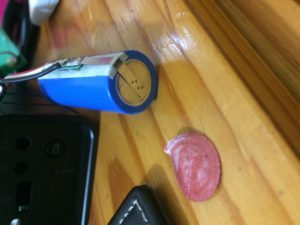 Around a year to two years of use, often sees the battery only lasting around 15 minutes. 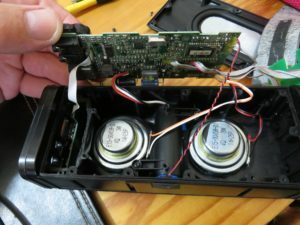 Luckily, replacing the battery is very easy. It uses the smaller 3.7 v, 18500 (1400 mAH) battery and not the standard 18650 battery. A small jewel screwdriver with a Philips (star) point and one with a flat point. A small soldering iron. 1:First flip the speaker over so that the bottom faces up. 2: Now gently pull the rubber strip away. There are 4 screws to be removed. 3: But first, gently pull the rubber padding in the center away. Use a flat screwdriver to help you push the bottom as you pull. This will help prevent the rubber from tearing. 4: Now push the internal black part through the color housing, towards the left. That is towards the volume and power buttons. 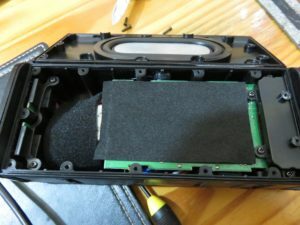 5: Once you have the internal black part out, flip it over to the side with the large speaker cover. There are 13 screws to remove. 6: The cover is held on with tape over the seam. Gently remove and then lift the cover off. There are 8 screws here in total to remove. 7: First remove the two black padding pieces. 8: On the far right are two screws holding the black part to the body, and 2 holding it to the pc board. 9: Under the black padding are 2 screws holding the pc board down. 10: On the far left are 2 screws hold a cover in place that itself holds the pc board for the buttons in place. 11: After you removed all the screws and the cover on the left holding down the pc board for the buttons, gently pull the pc board for the buttons back, and then out. It is held in place with glue. This will allow you to easily flip the large pc board up. 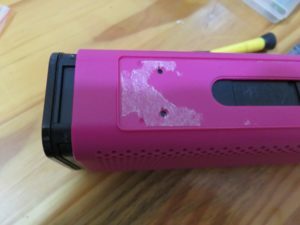 12: The battery is under the large pc board and held in place with a cover that has two screws. 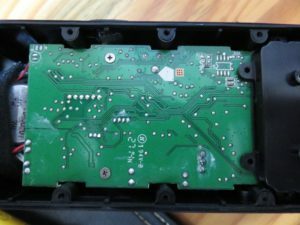 13: The battery wires do not have a connection, so you will need to unsolder them from the back. When putting the new one back, note how the wires are attached. From the top it is Red, White Black. 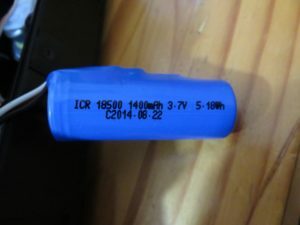 If you cannot find a ready made battery pack, you can reuse the old battery pack connections and use a normal flashlight battery. 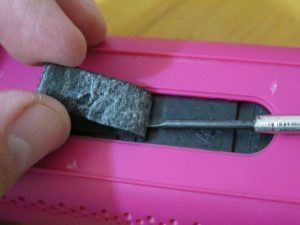 Remove the outer plastic coating from the battery. 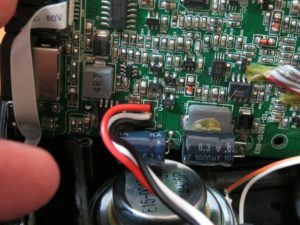 You will notice the three wires are connected to a small pc board with connections on the end of the battery. Remove the covers on the ends. 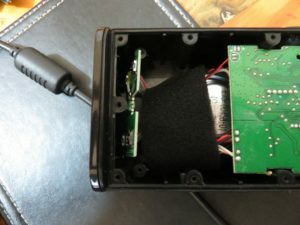 This will expose the connections on the battery. They are tacked onto the battery, so gentry pry them free. 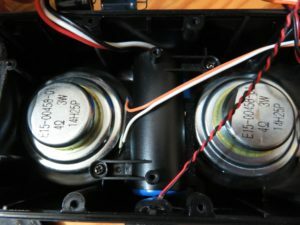 You can then solder them onto the new battery and put the covers back on the ends. The red is positive and black negative on the battery. 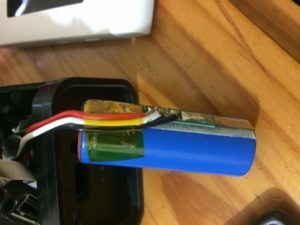 Once you have soldered in the new battery. 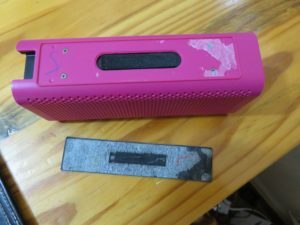 Reverse the steps by installing the battery, its cover, the large pc board. The small button pc board and its cover. The 8 screws holding them down. The two black protection pieces. The outer cover. Its 13 screws. Then the small protection strip over the joint. This is for vibration. Then slide the black section back into the color cover in reverse order. 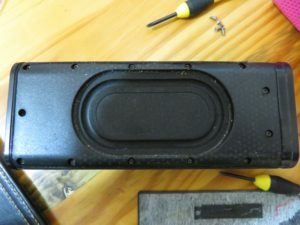 Put the 4 screws back and the central black cushion, then finally the black large rubber strip. If you like this blog, please buy me a cup of coffee.